Type or copy the following statements into a program window, and select Program →Run from the main menu. These statements open the Hurricanes data set from your PC and write the wind_kts and min_pressure variables to a server data set called Work.Hurr. These statements are explained in Chapter 2: Reading and Writing Data. In the Chapter 4: Calling SAS Procedures, you called the REG procedure with the Work.Hurr data and viewed tables and statistics in the output window. This time, you use the OUTPUT statement to create an output data set that includes the residual values for the regression model. When you run the program, SAS/IML Studio calls the REG procedure. The procedure creates an output data set named Work.RegOut that contains all of the original variables in Work.Hurr, plus a new variable named Residual. This variable is created by the R= option in the OUTPUT statement. Now that an output variable is created, you can add it to the DataObject. You can read variables in a server data set directly into a DataObject by using the CopyServerDataToDataObject module. (Note that the number of observations in Work.RegOut matches the number of observations in the dobj DataObject.) After a variable is in the DataObject, you can use that variable to create graphs that help to visualize the analysis. In this case, you can create a plot of the residuals versus the explanatory variable. The residual plot (Figure 5.1) shows many storms with large negative residuals. 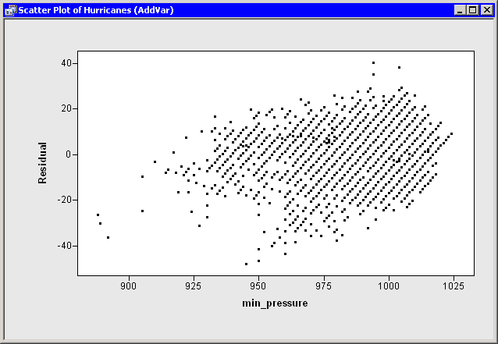 These storms had much lower wind speeds (20–40 knots lower) than predicted from their values of min_pressure.